We’ve posted the Oakland Athletics 2018 spring schedule, as the team prepares to build on a very successful 2017 spring-training tenure at Hohokam Stadium in Mesa. It’s that time of year, when we ask our readers to choose their favorite baseball venues in our Best of the Ballparks competition. In the first round of Cactus League selections, we ask you to narrow the field from 10 to eight. We put up two new schedules today: the full 2017 Oakland Athletics schedule and the home Los Angeles Angels of Anaheim schedule. Help us select the best Cactus League ballparks! 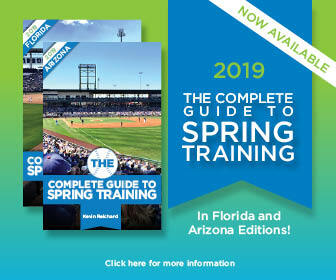 With games now underway, it’s time for Spring Training Online readers to select the best ballparks in the Cactus and Grapefruit leagues. Welcome to the first round of the Best of the Ballparks fan voting, beginning with the ballparks of the Cactus League in Arizona.